One –man electric car driven by Robot.This is what the Japanese tech conglomerate Hitachi has come up with. This one-man electric car does not require any driver.for,it drives itself and takes the passenger from one place to another without any manual assistance. 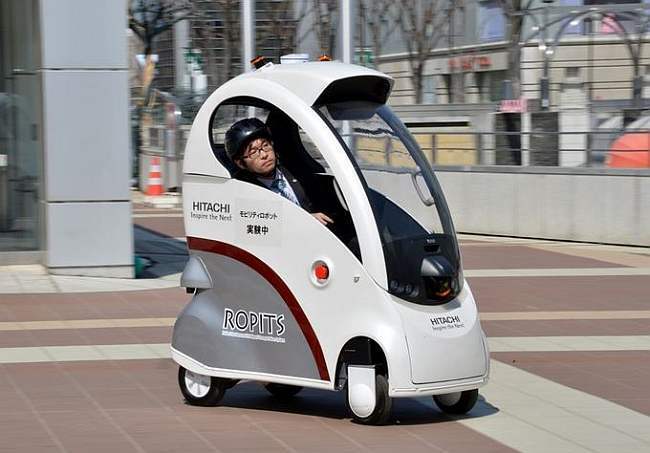 “The one-man car, called Robot for Personal Intelligent Transport System (Ropits), was unveiled in the city of Tsukuba in the Ibaraki Prefecture on Tuesday”,according to Kyodo news agency. “The vehicle is designed for sidewalks and can be programmed with a map-loaded tablet PC to set the course and time to transport senior citizens or other people with difficulty moving around”,adds the same agency. “The vehicle is equipped with GPS to allow it to find its way, as well as laser distance sensors to look out for obstacles and a gyro sensor to help it stay upright while negotiating uneven ground”,says the same report adding that the car’s ‘active suspension’ controls each wheel individually and allows the vehicle to tackle curbs and uneven ground, keeping the passenger’s comfort at the same time.